If you're contemplating a family road trip that takes in multiple national parks, there is arguably no better place in the United States to set your sights than Utah. The southern half of the state is home to the so-called "Mighty 5"—a remarkable quintet made up of Arches, Zion, Bryce Canyon, Canyonlands and Capitol Reef. Together, they deliver an unrivaled opportunity for a getaway that delivers not only spectacular scenery but as much hiking, biking, whitewater rafting, and stargazing as your troops can handle. It's doable. You can easily visit all five national parks in a week, with enough time left over to make other incredible stops along the way. It makes for an easy-peasy road trip. The distances between Utah's parks can be measured in hours, not days. You could see them all in a week or design a mini weekend road trip and take in just two parks that are near each other—say Zion and Bryce Canyon or Arches and Canyonlands. Map your route by taking National Scenic Byway 12, which passes through some of the most spectacular scenery and natural wonders seen along any rural route in the nation, or Scenic Byway 24, which travels along rolling sagebrush desert and drops into high valley farmland. You can keep it affordable with built-in free fun. Each of these national parks offer free ranger-led programs and Junior Ranger programs for kids. One standout is the special force of park rangers and volunteer astronomers known as “The Dark Rangers” at Bryce Canyon. These rangers conduct a night sky program that integrates a one-hour multimedia show with 90 minutes of telescope stargazing. Families can also take a guided hike and view the pictographs and petroglyphs in Horseshoe Canyon at Canyonlands. You can spend the night somewhere extremely cool. Along with the many wonderful hotels in the area, you can also find some fun and unique alternatives that will get your family embracing the stunning natural surroundings. For example, consider booking a glamping-style “tipi" at Moab Under Canvas, just outside of Arches and Canyonlands national parks, for under $85 per night. Shooting Star RV Resort is another unique lodging option where guests can choose from a number of Airstream campers designed to resemble the dressing trailer of famous movies. Hate planning? Leave it to someone else. Sign up for a weekend outing or week-long excursion with REI Adventures or Austin Adventures and forget about the stress of planning an action-packed trip. Your family will get to experience all the activities you love at your own comfort level and with expert guides. But wait, there's more. In addition to Utah's Mighty 5 national parks, the state's national monuments are equally as stunning. Grand Staircase-Escalante National Monument along Scenic Byway 12 is a 1.7 million acre park full of bold plateaus and multi-hued cliffs. Another must-see is Natural Bridges National Monument, which features three natural river-carved bridges connected by a nine-mile round-trip drive. Adventure in Arches National Park contains thousands of windowed arches, towering spires, and dramatic hoodoos. Take the 40-mile scenic drive from the park entrance and you'll find numerous parking areas for trail access and scenic overlooks. Be sure to hike to Delicate Arch, which is perhaps Utah's most iconic natural feature. Canyonlands is Utah's largest national park with views thousands of feet down to the Green and Colorado Rivers and thousands of feet up to red rock pinnacles, cliffs, and spires. The northern section of the park is called Island in the Sky, where visitors can look down to the Colorado and Green rivers. To the west, the Needles District is named for its profusion of red rock spires and sandstone fins. Looking for the quintessential American West from the big screen? Monument Valley was made famous in the classic John Ford westerns, including Stagecoach and The Searchers, and inspires awe with its dramatic landscape. This is the heart of the Navajo Nation. Travel along the Trail of the Ancients National Scenic Byway to Natural Bridges National Monument, home to three of the world's five largest sandstone bridges. The Navajo called Capitol Reef the Land of the Sleeping Rainbow due to the amazing colorful contrast of red Entrada and white Navajo sandstones. The central geologic feature, the Waterpocket Fold, is a bulging uplift of rainbow-hued sandstone reefs and canyons. At 9,000 feet above sea level, Bryce Canyon is Hoodoo Country, a series of natural amphitheaters sunk into pink cliffs and filled with delicate red rock "hoodoos." The best time to catch the most brilliant hues of the park are at sunrise and sunset. Take the 37-mile scenic loop drive for incredible vistas and hike the 1.3-mile Navajo Loop Trail, which wanders through the rock formations. 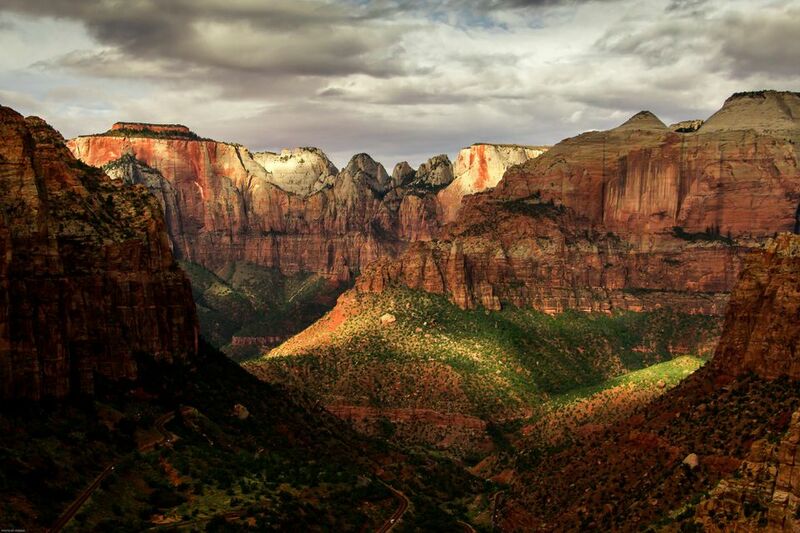 Carved by water and time beyond the stretch of the imagination, Zion translates to "The Promised Land" and is Utah's most-visited park. It is a canyon of soaring towers and massive monoliths. The Narrows is hailed as one of the world's best canyon hikes. This shady walk up the shallow Virgin River can be adapted for any ability level or time frame. Red rock canyon walls reach into the sky above as you splash and stroll through the river's cool waters.